This brightly illustrated book is part of our celebration series, which explores the way people celebrate different festivals around the world. In the story, Marek, his sister Alice, and their parents are visiting their extended family including their babcia (grandmother), dziadek (grandfather) and prababcia (great-grandmother) in Poland. All are involved in preparing for the big Christmas celebration and Marek is full of questions. Why does prababcia put hay under the table? Why does she set an extra place at the table? Why do they look for the first star of the night before they begin their feast? After the Christmas banquet, it is off to Midnight Mass for Marek, while Alice stays home with prababcia to see if at midnight “all the animals can talk.” But at midnight the kids are fast asleep, one at church, and one at home. After all, they have had a big day! 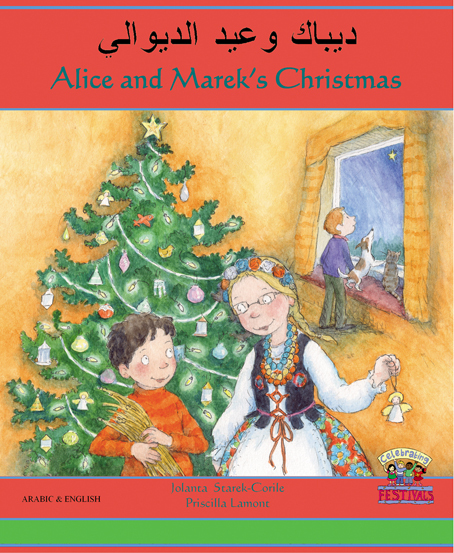 Marek and Alice’s Christmas describes many rituals of a traditional Polish Christmas, and invites readers to share in the celebration. Marek and Alice’s Christmas is available in English with Albanian, Arabic, Bulgarian, Croatian, Czech, French, Lithuanian, Polish, Portuguese, Romanian, Russian, Spanish, Urdu and Welsh. Hi, can i ask you something? I’m looking for children books with such “scary” illustrations like wolf (or fox) eating pigs (or seven kids or Red Riding hood or birds in Chicken Little) or being pictured with a fat stomach. Have you seen any book of this sort? Any sort of help is appreciated. Thanks in advance.